Since we were on the subject of motorhomes, I figured I'd post another...wait...what's that...you didn't want to chat about motorhomes...oh...sorry. The O309D Mercedes-Benz truck was the precursor to today's Sprinter van, and uses Mercedes sedan engines to push its plus sized chassis slowly around town. 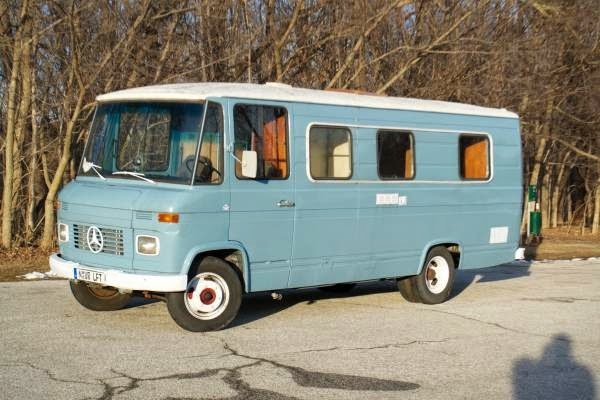 Find this 1967 Mercedes-Benz O309D L406D Dusseldorf T2 Transporter Series 1 offered for $10,000 in Noblesville, IN. You are probably thinking, what is this some kind of motorhome website? 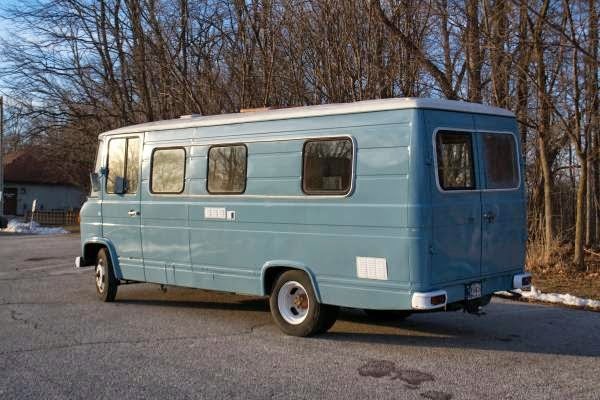 Truth be told, after posting that pile of rotting parts Cortez earlier today, I felt like some redemption was needed in the form of a ready to roll classic camper. This one does have some minor needs as described by the seller, but it looks in decent condition all things considered. The original engine was tossed in favor of an OM617 straight-5 cylinder diesel engine that is mated to the original 4 speed manual gearbox. You will be the slowest vehicle on the road, but you will always be able to reach your destination if you've got a simple toolset and enough zip ties/duct tape. No more campers for a while...okay? The seller seems very honest. But I couldn't imagine driving this without A/C. Motor home clique....redemption of proposed concept! But is the DT staff willing to go where it hasn't gone before? Or are they happy with what they've built? Either way, it's a win-win. Gianni gets me. Sorry, Gianni. But I'd vote for a wide array of cliques/niches/whatever you want to call them. I am seriously liking this. Converted by a German in the '70s - yeah, that interior has a pure '70s German-hotel-room aesthetic. Love the speedo that tops out at 100kph. I'm guessing it can just about get there on the level. These posts are so much imaginary fun for me. My mind conjures up short scenes of my boys bouncing out of the side door why I call them to help me unload the race car from the trailer...sitting with some other drivers on folding chairs next to the camper at night, a small fire in the middle of us, enjoying a well/deserved post-race beer/whiskey/whatever... Come to think of it, all of my daydreamin about the campers you post have involved LeMons racing, for some reason. Probably because that series has several examples of RVs that were purchased for pennies on the dollar and converted to race support/camper vehicles, often with brilliant engineering solutions for storage, brewing, et al. The last time I took the wife, kid and friends to a Jimmy Buffet concert it was in a rented RV in Nobelsville, IN. If I can't imagine getting them to go to Laguna Seca in something like this, I KNOW with certainty, they'd be willing to huff and puff (diesel) anywhere in the country to blend up some Margaritas, wear silly hats and pretend we could all sing in key. That's the first year. Then, it would have to come into the barn for a repower of some kind. Homey goes NOWHERE at 50-60mph! I'm too old and have to drive a lot faster than that if I'm gonna get anymore living into my lifetime!! In Pursuit of Buffet... That's a journey I can get behind. And +1 on the live life faster philosophy! Would that be Jimmy or Warren? That would make Warren happy as he now has a lot excess capacity since oil prices have dropped. Locomotives, the hybrids of hybrids. That must have been awesome to be in control of all that power. Moar Power Casey! Yes, yes, and yes! This is the RV I want! There's no shots of the engine bay, but I'm thinkin there's gotta be room for a big block BOP (Buick Olds Pontiac) in there. An engine with gobs of torque. I can't imagine how slow this beast is with that diesel. I think it is awesome. 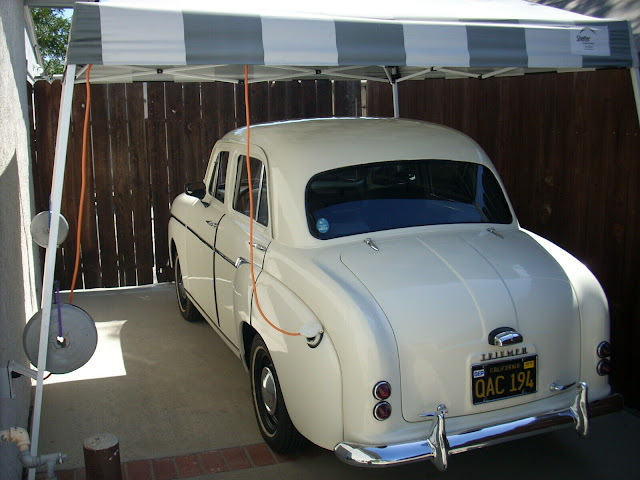 Way cheaper than a classic VW, and at least as easy to work on. Plus, way more unique and usable. Awesome find.